We are venturing into new territory this year. I knew it would come eventually but somehow we have managed to avoid it until now. We have started trying out a lot of activities this year. I wanted the girls to have exercise and I also wanted them to learn some skills and find something they enjoy doing. 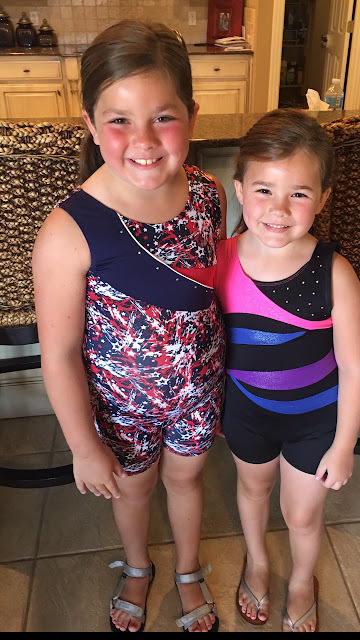 Harper has been going to gymnastics for a year. She is going twice a week this year and Hollis started this summer. They both really love it and Harper's cartwheel has come a long way. Harper started piano lessons last month. She loves music and I think piano lessons are such a great foundation just to be able to read music and understand the basics. So far she really loves it. She's been good to practice. I especially love that she can do this even with her hearing loss. I'm hoping Hollis will start taking in the spring. I want to wait a little longer. I think 7 or 8 is a good age. Harper loved swim team so much this summer that I thought it might just be a great sport for her. She's a good swimmer and it's such great exercise that you can do your whole life. This just started up this week. It was a little stressful because it was inside and the pool area is SOOO loud and there were so many kids. I was so stressed for her because she can't wear her hearing aids and I couldn't hear anything so I knew she didn't know what the coach was saying. But she did great and I think it will get easier. My favorite part about swim team is that there is childcare at the gym so I can take Will Holden and focus solely on Harper. Or work out while she swims. She has this twice a week. And Hollis has been begging to play soccer. I wasn't sure how this would go but she was SO excited. We just had our first practice last night. I was so proud of her. Hollis two years ago would have NEVER been brave enough to play soccer but school has been so good for her confidence. I'm excited for her to do a sport. I told Scott she could possibly be our athletic one. Well - until Will Holden gets ready to play. Or he might want to play in the band. Or who knows what he will choose. And Sunday my girls will start back into choir and GA's. So we have something every day but Friday! We are getting used to our new normal. We love being home and having dinner at 5 as a family but now we are getting home later and being on the go. But we are still spending time together. And the kids are expanding their horizons and I love it! And I'm making use of my crockpot!